Yesterday was my first attempt at lining up the user-led solutions for a better national equipment search portal. And serendipity had come up twice. My initial goal was to run a short session with a few doctoral students to understand their workflow for finding a piece of kit. And unexpectedly, I also ended up learning about equipment sharing from a real case of “artist meets chemical analyst” at a public discussion later in the day. I had the opportunity to speak with 3 PhD students from the Doctoral Training Alliance (DTA) cohort that were already interested in the main problem that we are tackling: how to find the right research equipment to run my experiments successfully. This was part of a full-day event organised by the University Alliance (UA) for the bioscience doctoral students. UA picked an amasing venue – The Wellcome Collection. As I arrived at the Wellcome Collection and was trying to figure out where the DTA students were, I noticed an A4 poster just at the entrance. 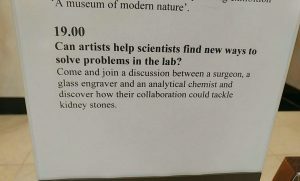 A drop-in talk in the Reading Room: “Can artists help scientists find new ways to folve problems in the lab?” I was intrigues, and couldn’t miss it. Serendipity ensued. I learned what I was looking for: a case of artist meets chemical analyst and shares equipment. Of all the creative things that artists could offer, Katharine, a geographer turned glass engraver, had a piece of kit for Matt, the chemical analyst from Imperial College. Matt was trying relentlessly and without much success with all his thousand-pound-worth of equipment to get a cross section of a kidney stone. I was curious about how this happened? How is it that Matt or Katharine found out about each other’s techniques or equipment and how could we translate that onto a better user interface for our digital platform? As it turns out, it was serendipity. When the problem came up in his research, Matt asked around, but he did not spend a lot of time on it. It was a side project. They have a huge log of side projects. And perhaps the first thought was ‘not enough funding’, as the minute work that was required to cut a kidney stone implied the need for a very expensive and accurate machine. 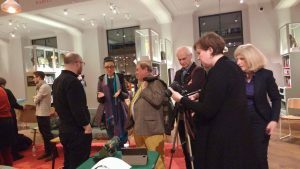 About a year ago, though, Matt and Katharine sat around the same table at an event that was intended to promote cross-disciplinarity: artists and scientists working with their hands and their equipment. Now, Matt is collaborating with Katharine to cut the 2-5 mm-sized kidney stones so that he could figure out their full crystalline structure and perhaps even help understand the reasons for why these stones formed in the first place. When asked what they would do when looking for a piece of equipment, the DTA students said they would talk to their supervisors and peers. Like Matt, if they did not know yet the piece of kit they needed to use, or they needed something a bit more creative, they would ask colleagues or search online by technique or methodology. And they are also very interested in finding some of their peers that have already used that specific piece of kit. Matt spent little on this search because it was a side-project, and he didn’t feel that he was going to get anywhere far with Google. But he didn’t yet know about equipment.data! By design and by serendipity, I confirmed yesterday that the search on equipment.data could do with a number of critical improvements: a filtering and browsing functionality by technique, methodology, skill, manufacturer, and other such features. If you used equipment.data, let me know your thoughts and what you would expect to see more of? And I would like to call all researchers and friends of researchers, tell us how you search for equipment to run your research? We are looking to run a few more similar sessions, so let us know if you are interested. Bringing the list of equipment together was the first step in setting up of the national research equipment portal and we are now learning from researchers about what they actually need to find the right piece of kit to run their experiments. Our aim is to build in these user stories by enriching and working with the data in the most automated and cool way, using machine learning and text mining, for example. As always, we are open for ideas and suggestions! And look out for our first release within the next month.